OK>. another question about the 2210. Do I need to use any fuel additives (anti-gel, etc) during the winter? 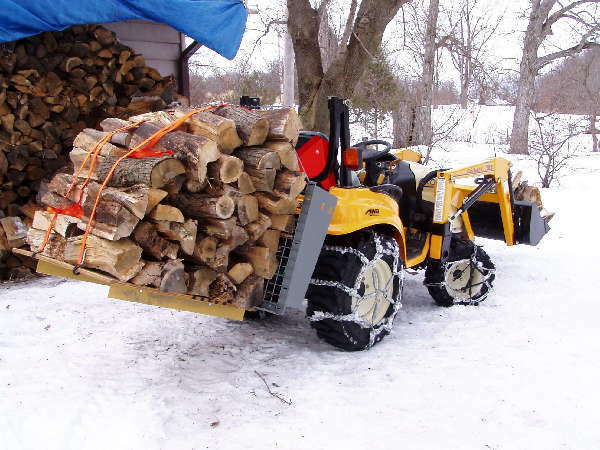 The tractor will see sporatic use, mostly to clear any snow we might get, for the next few months. Definitely treat your fuel with an ati-gel and cetane booster. I use Power Service available at TSC. I have used it for years here in Michigan and haven't missed starting due to gel yet. Anytime the temperature gets below 14 degrees, you need to be concerned about gel in the fuel filter. Most fuel available for over the road service has already been treated, but I treat mine anyway. Sometimes the tractor sits for a week between starts, and I want to be sure it is there when I need it. I add about 2-3 ounces for a 5 gallon can. I use Power Service also, I got it at Wally World! How much PS per gallon? I've seen that at Walmart just the other day. Looked at it but didn't buy because I wasn't sure. It's *little* bits of info like this that makes this website worth subscribing to. Since it only takes 1.5 ounces of Power Service to 5 gallons of diesel I picked up a cheap oil mix syringe at Wally World as well. I only bought a quart of Power Service for a couple of bucks, it probably loses it benefit if left in a gallon jug for over a year, I just don't use that much diesel. Maybe I did the fuzzy math but I mix mine at .6 oz. per gallon. I use the Power Service in the White bottle for winter use. In most area's the fuel is already treated by the distributor and none it needed but it is VERY cheap and WISE insurance. The John Deere fuel additive is good stuff too as is Stanadyne Performance Formula. I think I may be using that "fuzzy math" combined with my CRS Dennis. ;O) I may be thinking about the Power Service in the Silver bottle but I thought the mixture was the same for that too? I also use the Lucas fuel additive oil too and I may have cornfused that. I rechecked my fuzzy math and it looks like .32 oz. per gallon. I just guesstimmate and dump some in. Maybe I should measure?